The ZTE Micro USB Travel Charger is designed for portability and convenience. 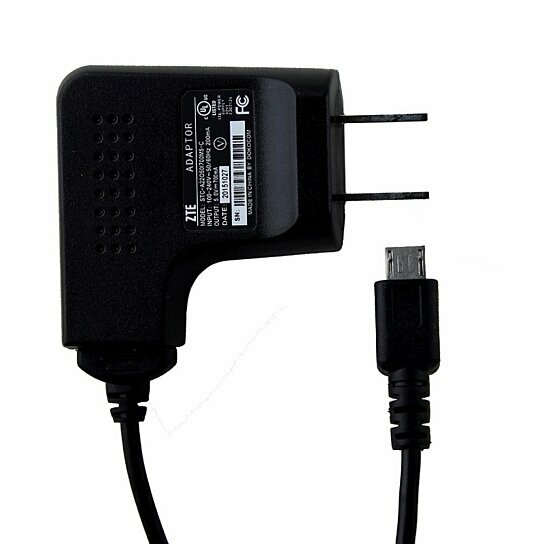 Charge your ZTE phone with this original OEM ZTE Micro USB Travel Charger. The thin design makes it perfect for travelling and will not occupy too much space in a surge protector. Stay powered and connected with this portable travel accessory from ZTE. Specifications: Input: 100-240V~50/60Hz 200mA Output: 5.0V=700mAh Cable length: 5 feet 11 inches Part Numbers: STC-A22O50I700M5-C / STCA22O50I700M5C The ZTE Travel Charger is manufactured by ZTE and is compatible but not limited to AT&T Avail, AT&T Avail 2, AT&T F160, AT&T Radiant, AT&T R225, AT&T Z221, AT&T Z222, AT&T Z431, AT&T Z998, Boost Force, Boost Max, Boost Warp 4G, Cricket Engage MT, Cricket Engage LT, Sprint Force, Sprint Optik 2, Sprint Vital, T-Mobile Aspect, T-Mobile Concord (ZTE Concord), T-Mobile Concord II (ZTE Concord II Z730), Verizon Wireless Salute, Virgin Mobile Awe, Virgin Mobile Chaser, Virgin Mobile Reef, Virgin Mobile Supreme, ZTE Agent E520, ZTE Anthem 4G N910, ZTE Aspect, ZTE Avid 4G, ZTE Chaser, ZTE Chorus, ZTE Cricket Engage LT N8000, ZTE Director, ZTE Engage V8000, ZTE Fury, ZTE Grand S Pro N9835, ZTE Groove, ZTE Imperial N9101, ZTE N800, ZTE N9500 Sprint Flash, ZTE N9510, ZTE N9810, ZTE Prelude Z993, ZTE Reef N810, ZTE Render, ZTE Score, ZTE Score M, ZTE Warp, ZTE Warp Sequent, Verizon Wireless Salute, ZTE Agent E520, ZTE Vital N9810, ZTE V9, ZTE V72C, ZTE V880 and most all other USB powered mobile phones.